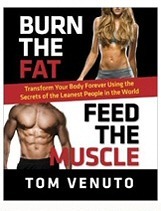 One of the best books on fat burning and nutrition I ever read was Burn the fat, Feed the Muscle by Tom Venuto. Still a lot of people don’t know about the book yet so I wanna share you the good and the not so good in this little review. There are an endless amount of programs out there, all claiming to help you get rid of unwanted fat and weight, but very few focus on keeping it off. The difference with this program is that it helps you to get and keep the weight off, by implementing workout regimes and diet plans. 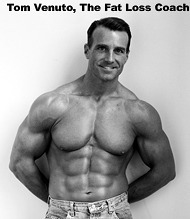 The creator of this program is famous bodybuilder, Tom Venuto. He is well known in the bodybuilding industry and this makes his program all the more credible. Those of us who have tried it will testify to the program’s undeniable effectiveness. Tom Venuto combines his experience in the body building industry with his natural flair for words to create this amazing eBook. His articles have appeared in many famous publications, including Oprah Magazine. 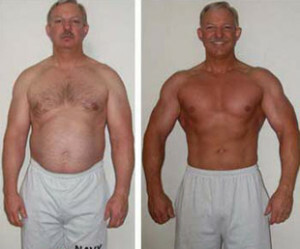 The veteran in the weight loss field delivers a unique strategy, unlike any other to create multiple phases of weight loss and muscle training that all work together to create the desired result. The basis of this program is formed by identifying your body type. Most people fail in their goals to lose weight and build muscle, simply because they do not know their body type and as a result are unable to cater to its unique needs. If you want to be successful you need to create diet plans that are suitable for you as an individual. Once you have determined your body type, you may move on to phase two, which helps you to adapt your diet and exercise regime to suit your body type. This phase will involve either reducing or completely cutting out certain food types, that may hinder your performance. Phase three is perhaps the toughest phase out of the three. It simply requires you to follow through with the program – without quitting before your desired results are achieved. This is often easier said than done. However, Tom Venuto has a solid structure and plenty of information at your disposal, to help you beat the cravings. If you follow through, your results will be all the reward you need. The other advantages are that the program helps you to create meals that are suitable for your body type and this takes the guesswork out of it all. You also do not need to pay gym membership fees or invest in expensive equipment as all the tools you need to be successful are at your fingertips. Tom released a new program called “Burn The Fat Body Transformation System” and it looks very promising! The all-new program comes with a 7-day Burn The Fat Quick Start Program and “Inner Circle” support community. I will be posting more information about this new program soon, in the meantime check out Tom’s website to learn more. The eBook contains comprehensive information regarding recipes and meal plans, but it is somewhat lacking in the area of different muscle building exercises. Still, the Burn The Fat – Feed The Muscle program by Tom Venuto is one of the best on the market and delivers on everything it promises. I can personally recommend it!